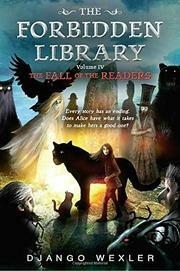 Alice Creighton finds out surprising truths about her own origins in this fourth and final book in the Forbidden Library series. No longer controlled by her master, Geryon, who is now trapped in the book The Infinite Prison, the white girl is free to take input from the labyrinthine called Ending, the library’s guardian, who urges her to liberate its kind from the Readers. It seems like a good idea at the time, as does confronting and unraveling the Great Binding. But Alice finds out that being a leader means taking on continuous responsibility and making practical choices in everyone’s best interest, even when it’s not so easy to figure out whom to trust and not so wise to be led by longings for revenge. The pacing of this volume gets uneven at times, as long, drawn-out scenes are interspersed with concentrated chunks of new information. But Wexler successfully keeps the book, reader, and library metaphors central, while highlighting Alice’s growth as chief decision-maker, visionary and risk-taker.